Mouse Broadcaster comes in two parts - Master and Minion. The master controls the minions. Basically, right and left mouse clicks and movements are replicated from the master to the minion computers as well as key strokes including basic key combos. The only key combo I've found that won't work is CTRL+ALT+DEL. I use this program to update an entire lab of computers all at once which require user input. Default UDP port for both is 2222. To change the minion port, launch with a -port command (such as "Mouse Broadcast - Minion.exe -3333"). The broadcast IP is calculated automatically, but is not guaranteed to be correct, especially if you have multiple IP addresses. I do not recommend using a wireless connection. Pressing Start minimizes the program to the notification area (system tray) so that window counts on the taskbar are equal. 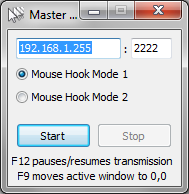 Double-click the icon or press F12 to make the program visible. Pressing F9 will move the active window to 0,0 on master and minions. This should prevent inconsistencies between computers. Finally, the DLL is required on the Master side. You will need to add an exception to your antivirus for this, as any good antivirus will flag it as a keylogger. Because essentially, it is. You're capture keystrokes and sending them across your network to your minions. I haven't found a different way to do this, so for now that's the caveat. I have no problem if you decompile that DLL to reassure yourself that nothing suspicious is going on. Please note that traffic is sent unencrypted to the IP. It's not traditional data, but someone COULD potentially compile your keypresses. So avoid sending passwords if you have ANY doubts as to what you're doing.